The Dianel-5120 Hardware and software system with the professional «Dianel-iON» software can perform the objective psycho-physiological condition assessment. Record of two-channel GSR signal Simultaneous recording of voice / sound (Dialog, talks between psychologist and patient). Collection of complaints and the patient's history with an option to register prior to the study. Conducting stress tests (active orthostatic test, samples with hyperventilation, breath holding test) with parallel GSR signal registration. Conduct psychological testing, using appropriate questionnaires and parallel registration signal GSR. Analysis and interpretation of the data according to the method by Suhodoev V.V. Selection and placing on health products from a database program «Dianel-iON» according to the identified state. Formation of case history (conclusion), including placing on health-improving procedures (physiotherapy, diet, auditory training, weight loss programs, etc.) using the templates from a database of «Dianel-iON» software. Conducting sessions of biofeedback therapy using methods and techniques of audiovisual oftalmo-colour therapy correction with simultaneous control of the physiological state of change by registering GSR. Print of GSR results analysis chart, the table values ​​and recommendations. Maintain filing of test results and a database of patients and operators. You can buy DIANEL-5120 psycho-physiological condition test system on an installment plan. More on the Installments conditions for Dianel-5120. Simultaneous voice recording (Dialogue, conversation between a psychologist and a patient). Collection of complaints and patient's history and adding them to the Case report form prior to the test. Conducting stress tests (active orthostatic test, hyperventilation tests, breath holding test) with simultaneous GSR signal registration. Conducting psychological tests, using appropriate in-program questionnaires and signal GSR registration. Selection and prescribing medication and therapies from the «Dianel-iON» adatabase according to the identified condition. Generation of case history (conclusion), including placing on health-improving procedures (physiotherapy, diet, auditory training, weight loss programs, etc.) using the templates from a database of «Dianel iON» software. 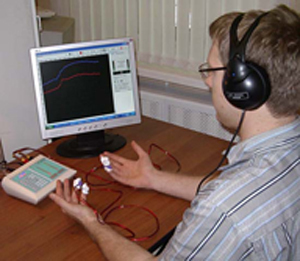 Conducting sessions of biofeedback therapy using methods and techniques of audiovisual oftalmocolourtherapy correction with simultaneous control of the physiological state of change by registering GSR. Solutions to optimize the way a human problem points and problematic situations during the execution of professional activities. 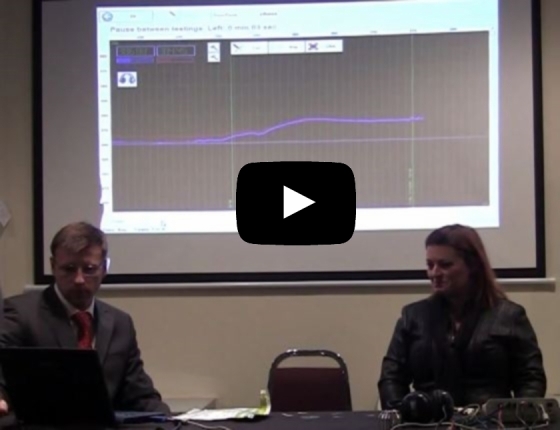 In individuals who are coping on the background of systemic diseases for application of psycho-correction using the principle of biofeedback sessions during the color and music. Automatic calculation of the data - the results of measurements are converted into a digital number and automatically calculated on a logarithmic scale, which allows the most appropriate interpretation of the data. The versatility of the instrument is determined by the possibility of a wide variety of research and treatment. Similar devices for 2-channel recording with the possibility of GSR logarithm results and at the same time the color and / or sound effects do not currently exist! Changing the psychosomatic status causes changes of homeostasis and appears in variety of physiological responses. The term "homeostasis" was proposed by American physiologist U.Kennon in 1929. Homeostasis, by Kennon – is coordinated set of reactions that maintain or restore the constancy of the internal environment in organism. The most important role in maintaining homeostasis plays the cerebral cortex and the endocrine glands. Changing of homeostasis is a result of complex coordination and regulatory relationships, as implemented in the whole organism, and on the organ, cellular and molecular levels. Thanks to adaptive mechanisms the physical and chemical parameters that determine the functioning of the organism, vary in a relatively narrow range, despite significant changes in external conditions. In higher animals homeostasis have the highest perfection. In humans, mammals, birds, homeostasis involves maintaining a constant concentration of hydrogen ions (pH) and blood composition, the osmotic pressure, body temperature, blood pressure, and many other functions. Homeostasis is provided by neuro-humoral, hormonal, barrier and excretory mechanisms. For example, the alignment of arterial blood pressure rules by regulatory mechanisms that come into play on the principle of a chain reaction with feedback (changes in blood pressure accepts by baroreceptors vessels, the signal is forwarded to the vascular center, changes of their state leads to changes in vascular tone and cardiac activity, while irritated chemoreceptors of vessels, switchinw on a system of neuro-humoral regulation, and blood pressure returns to normal. Phsychophysiological imbalance condition of the body caused by disorders of the nervous and humoral influences and occured in the general pathological processes, is determined by the rate of change of electrophysiological properties of skin by measuring the electrical potential and the electrical impedance. Change in the bioelectric activity of the skin, as a measure of spontaneous vegetal activity, demonstrates complex, interconnected reactions to external stimuli and internal processes and is called galvanic skin response (GSR). Basis for the formation of electrocutaneous conductivity signal is to regulate the intensity of the metabolic processes in the skin. The major factors in the conduction of electrical current can be considered ionic processes. There are two methods of registering galvanic skin reaction agree to Tarkhanov (check electrical potential of the skin) and Feret (check electrical resistance of the skin). In the presented model of hardware and software complex «Dianel 11S-iON» (Figure 1) is implemented registration of galvanic skin response by method of Feret. The method is most useful for displaying symptoms of GSR is a measuring skin conductivity when exposed to direct current followed by separation of the received signal at the tonic and phasic components. Tonic component of GSR caused by ever-present background conductivity of the skin, which changes slowly over time. Phasic component - the fast-paced changes of skin conductance, arising against the tonic component resulting from various stimuli. Phasic waveform component provides an opportunity to highlight such things as the rise and fall time of the reaction, which are important informative. To get information on the special electrocutaneous conductivity metal sensors on the palmar surface of the terminal phalanges of the 4th and 5th fingers of both hands, in accordance with the methodological requirements of minimizing the impact on their own ionic processes in electrolytes of skin, a pulse order 2mkA. The electronic unit AIC «Dianel 11S-iON» received ECP electrocutaneous capacity increases, digitized and fed through the USB-port of the computer, where it is processed by a special program «Dianel iON». Update Dianel-iON free to all users of our equipment from 03/01/2012. The resulting signal is visualized on the display, as shown in Figure 2. All tests are accompanied by simultaneous measurement surveys GSR on two channels - left and right hand, which allows to evaluate the work of asymmetry of the cerebral hemispheres. - Of course, psychological test questionnaire is automatically calculated by Dianel-iON Software.